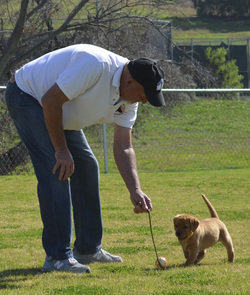 ​Tom Tackett is a behaviorist and competition dog trainer based in Orange County, CA since 1977. 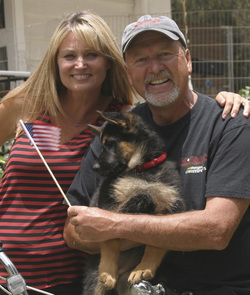 As a recognized authority on obedience and protection training, Tom has appeared as an expert witness in court cases and on numerous local television programs. Competitive in Schutzhund Trials, he won the first all Rottweiler National Schutzhund III Trial in Florida in 1985 with a perfect score (100) points in protection. While in Germany acquiring “Arras Zur Spielmans-Au”, the 1985 European Champion & World Champion Rottweiler, Tom was certified as a Schuzhund Trial Decoy by the German Rottweiler Club (ADRK). He was president of the Southern Counties Rottweiler Club from 1992-1995. With an emphasis on continued education, he has sponsored numerous Police seminars. Additionally, he has composed nationally distributed audio tapes on dog behavior for veterinarians; written articles for the Orange County Register entitled, ”Dogged Dilemmas” from 1992-95. California & Orange County Rehabilitation Programs recognized Tom’s school for Trainers from 1988-96. In August of 2006, Tom and his Black Lab, “Kona” were certified as a “Certified Mold Detection Team” at Vom KaiserhofeTraining Center” in Lawrence, Ks., as well as with the “World Detector Dog Organization” based in Vincent, AL.